More and more travellers are transiting through Mauritius Airport. Tourism growth is forecasted to increase significantly within the next few years. To cater for the corresponding projected increase in passenger flow, the existing facilities at Sir Seewoosagur Ramgoolam International Airport will be extended. A new terminal, with a capacity of 4 million passengers, is under construction to connect the existing one. 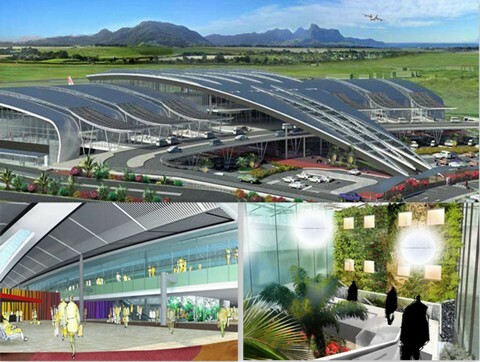 The architectural concept of the future terminal is inspired by the “traveller’s tree” (the ravenala palm), a tropical plant found in Mauritius. Credit goes to ADPI’s (Aéroports de Paris Ingénierie) architects for this marvellous design. ADPI has also been chosen to engineer the construction of the new terminal and its associated infrastructures. Much emphasis is laid upon delivering quality terminal facilities and services to travellers. A colourful eco-friendly architecture with luminous passengers’ circuits will be enhanced with indoor plants, vertical tropical gardens and water walls. To reduce heat inside the future terminal, the building facades will be thermo-insulated. The new terminal is planned to be operational in April 2013.